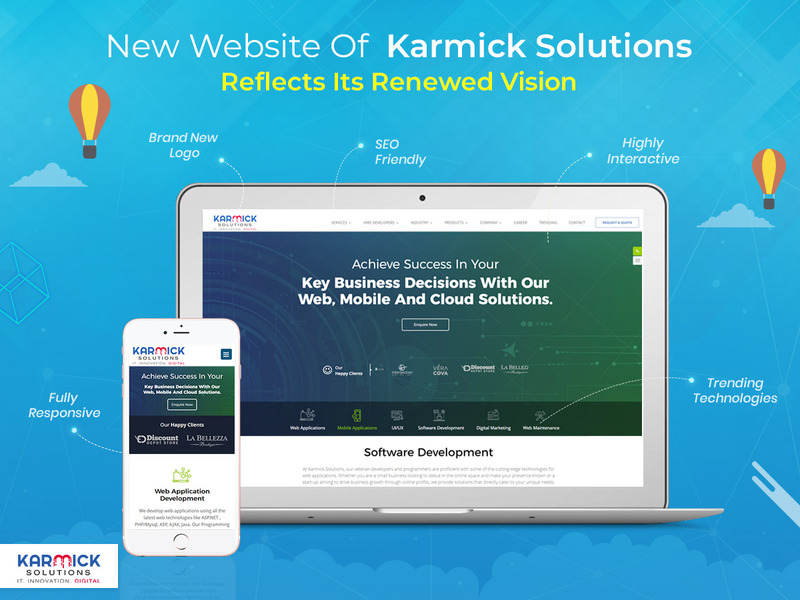 We are overjoyed to announce that our new website www.karmicksolutions.com is LIVE today. Our objective behind the website overhaul was to offer an overall enriching browsing experience to our visitors and potential clients. We ensured that our new site excels in performance, aesthetics, navigation, and content to carve a niche for itself in the digital market. Along with being highly interactive and fully responsive website, it also packs in information mainly related to industries for which we have worked, case studies of our client projects, our new services, and the trending technologies which we are employing in the recent times. Features like integrated social media buttons for Twitter, Facebook, Google+ and LinkedIn, easy ‘Request A Quote’ option and Live chat will facilitate our clients to interact with us more easily. Also, our blog section would give more insights into our organization and trending technologies. The new website will give a comprehensive understanding of our company, our solution and service offerings, the technologies we employ, the industries we cater to, the ready-to-use software products we made, the big-shots we worked for, and our hiring as well as engagement models. Our blog section will be regularly updated with fresh content. We hope that our new website appeals to you and serves as a channel to connect with us. For any queries, suggestions, comments or feedback, email us at sales@karmicksolutions.com.